There is nothing better than freshly caught Louisiana Redfish. The term Half-Shell refers to a redfish that when cleaned you leave the skin on what I refer to as a slab of meat. Most people seem to take the scales off to make a cleaner presentation. The fish is cooked on a BBQ Pit with the skin down, which takes the brunt of the heat and any flame ups from the coals. We use and are huge fans of The Big Green Egg and for this application used pecan wood chips. Ingredients: 3-4 red fish, seafood rub, 1 stick butter, 1 cup pecans, a grill! Soak your wood chips for an hour. 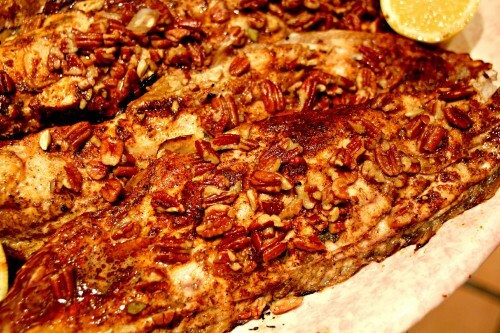 We used pecan, but BBQ aficionados tend to prefer fruit woods for fish, such as apple. Academy, Big Box, or hardware stores carry a good selection. I get my grill up to 250-300 degrees for a good while then place the soaked wood chips to get a good smoke going. Season the fish with your favorite seafood rub (We use Paul Prudhomme’s). Go easy here. Less is more. There is no need to overpower the fish, especially if you use smoke. You could just use some kosher sea salt and pepper. In a small sauce pan, melt a stick or MORE of grass fed butter, then add a cup of sliced pecans, and a squeeze of lemon. After about five minutes spoon the mixture over the fish. (Fresh chopped garlic is awesome in this recipe as well). Save a little of the butter to add during the cooking process. Put the redfish slabs, skin down on your pit. The smoke will be rolling at this point. The cooking time will depend upon the thickness and size of your slabs! Remember to add remaining butter halfway through. What you are looking for is the separation of the meat to determine when it is done. With experience, you will recognize what this looks like. These slabs took about 20 minutes on 250 degrees. Use a large handled spatula to remove on a plate. Hit with an additional squeeze of lemon at the end. Note: pair any of our vegetables with this recipe! I personally love the kale salad with it. 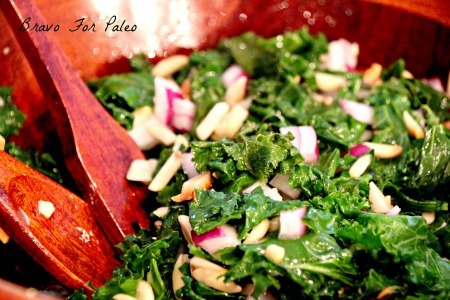 If you are confused about how to eat kale, this Kale Salad Recipe will be a great start. For a while I never knew how to use kale. The only use I could find for it was juicing it with a ton of other veggies. Since kale is a superfood, I knew it was a wonderful vegetable to add to my diet. This kale salad recipe will make you ask why you haven’t been eating kale every day! I personally like to make this salad on Sundays and eat it all week long. It’s a wonderful lunch (throw some chicken on top) or great with dinner. Heard of kale, but never knew how to eat it? This salad is the best way to get your daily dose of greens in! 1. Separate kale, and remove leaves from stems. Rinse well. 2. Fill a pot with water and place a double boiler on top. 3. Steam the kale for about 1-2 minutes. You want it to be softer than it began, but the texture is really up to you. 5. Add red onion and almonds and toss salad. 1. Mix ingredients and store in fridge. It is very important to steam the kale. This is the key ingredient in making the kale taste delish! The dressing makes enough dressing for a weeks worth of salads. I make this amount of dressing because I like to have extra, and then there's no excuse to use a store-bought dressing! Having trouble with quick on-the-go snacks? 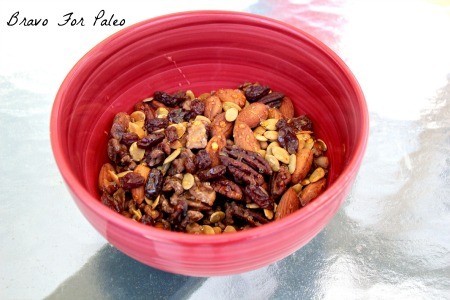 This is definitely my favorite Paleo Nut Mix Recipe. It’s perfect to bring on a road trip, with your lunch, or to keep in your car for hunger emergencies. If you have some digestive issues with nuts, try going through a soaking process, in effort to try and eliminate anti-nutrients and tummy aches. I soak my nuts in Himalayan or sea salt overnight, then I dehydrate them in a dehydrator or in the oven on the lowest setting. Many people do not realize un-activated nuts have anti-nutrients which can attack the intestines similar to grains! I advise “activating” your nuts all at once in bulk! I did this and it lasted me weeks of healthy nuts. Having snacks on hand is very important when it comes to staying healthy. If you are in a situation where there’s no Paleo options and you are very hungry, than having these nuts in your purse, car, backpack, etc. will be very helpful. This recipe is just my favorite nuts and seeds with a bit of sea salt and honey. You can add your favorite nuts, but remember peanuts are not actually nuts, they’re legumes and not technically Paleo. Most people can easily overeat nuts, especially when they have some sea salt and honey on them! I like to portion mine out into small ziplocs so that I know the right serving size for a snack. This is the ratio I use for my nut mix, but I make in much larger bulk. Feel free to half, double, or triple the recipe depending on how much you want to make. This is a great snack to keep in your purse for those times when there are no paleo options!